I had so much fun this weekend (You can see Skein Lane’s photo album here!) …I hardly know where to begin. I loved working in MaggiKnits booth….the product is great and so were the customers. One of the first things I saw was the Sleeveless Dip Vest….I immediately called Karen K (of my Skein Lane knitting circle) saying you need to see this…it has your name written on it. She came, she saw and we will see her wearing the vest soon. She knits with lightning speed. It was so great seeing so many old friends from my Skein Lane retail days….some were customers…some were vendors…some were associates. There were so many but the names that come to my mind at the moment include Yodi and her friend Alice. Yodi had such wonderful things to say about our Skein Lane days together…it made me remember one of the reasons I wanted a Skein Lane community…I was inspired by my Grandma Alta’s love of community….she spent much time with her quilting groups/friends. In the middle of the afternoon a person that I thought I recognized came into the booth with a couple of her friends. I’m thinking that it is Candi Jensen…and by golly it was. Candi and I met years ago when we took the same shuttle along with Barbara Scott from the Portland airport to the Portland Stitches Conference…must have been 1990. I remember that I had so much fun…my first Stitches conference and I was over the top with enthusiam..and knitting purchases. Candi’s and my path have crossed several times during the following years which included her visiting Skein Lane retail. 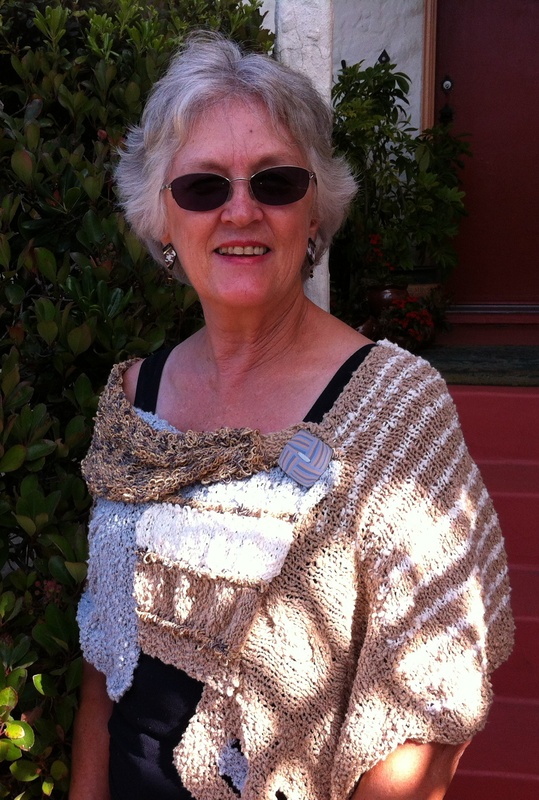 Barbara Scott is a dear friend of one of our knitting group dear friends – Jean Canon….Barbara has visited Skein Lane knitting workshops over the years…I am always so honored to have Barbara, a master knitter, in our presence. As I was writing up the sales receipt for one of Candi’s friends, I notice that the name is Debbie Macomber…I ask, “Are you the author?” And it was. Debbie has written many novels with a knitting theme….one of her first with a knitting theme was about a yarn store on Blossom Street. I googled it tonight and I was amazed at how many novels that Debbie has written over the last 30 years….who knew?! The market closed at 6 p.m…..I couldn’t believe that I wasn’t tired. I headed over to the bar to meet up with my knitting friends…most from the Friday morning knitting workshop. Eleven of us then moved on to our dinner at Piatti. The group has been dining here for several years when they have attended Stitches. In previous years I was either working the Stitches show or I had family obligations which prevented me from joining them. This year was different…I joined…it was such a lovely evening….the restaurant even had a gluten-free menu for people like me. Okay….this wraps up Friday at Stitches. Tomorrow will be all about Saturday at Stitches. We did have us some funs. I’m still recovering.